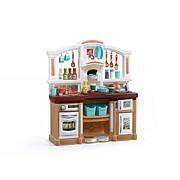 Make play time a party with the Lifestyle Party Time Kitchen by step 2! 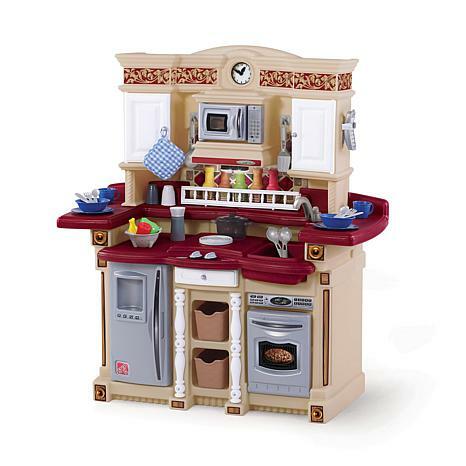 This play kitchen is ideal for multiple children and features a variety of play features with multiple storage areas play kitchen accessories and various “appliances” for maximum fun. Made in USA of US and imported parts. Accessory set phone and clock made in China. Realistic "stainless steel" oven, microwave, and refrigerator. 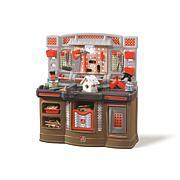 Four electronic features: toy microwave, stove top, overhead light and phone to increase interactive play. Frying pan and boiling pot activate frying and boiling sounds on front burner, enhance make believe fun. Special silverware drawer and two "wicker" storage baskets for kitchen toy accessories. 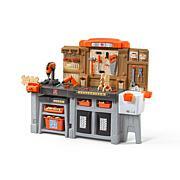 33-piece accessory set included (colors of accessories and play food may vary). Requires five "AA" and five "AAA" batteries (not included). Adult assembly required. 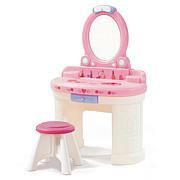 Item dimensions: 43.5x39.5x17 in. Age range: 2+ years. Limited 3 year manufacturer warranty 800-347-8372.